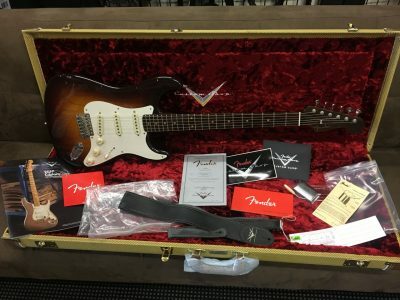 Bulk of Info from Fretted Americana. 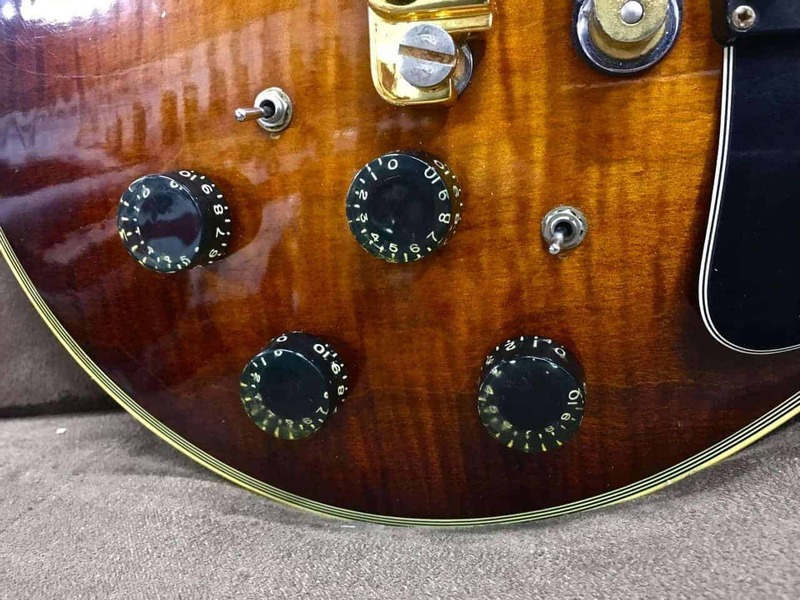 This “Tobacco Sunburst” Kalamazoo made Les Paul Custom “25/50 Anniversary”. 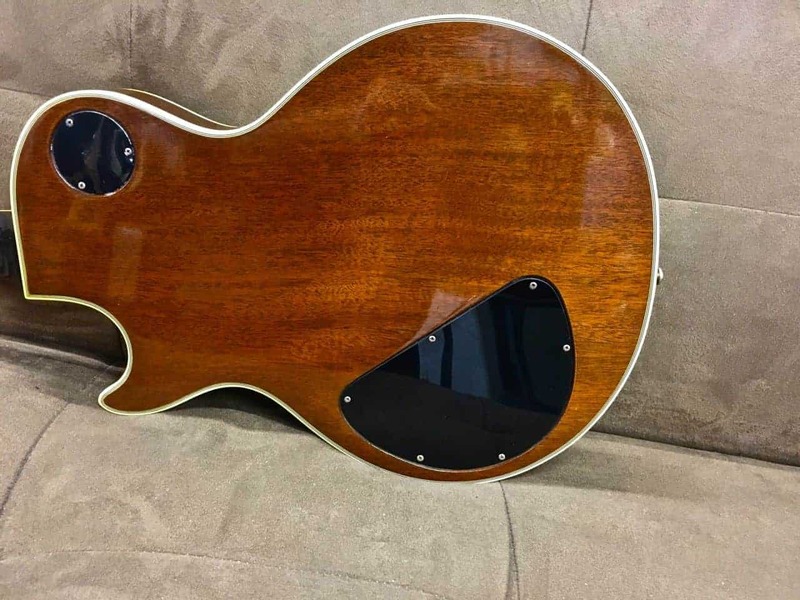 Solid mahogany body with highly flamed two-piece, book-matched carved maple top. 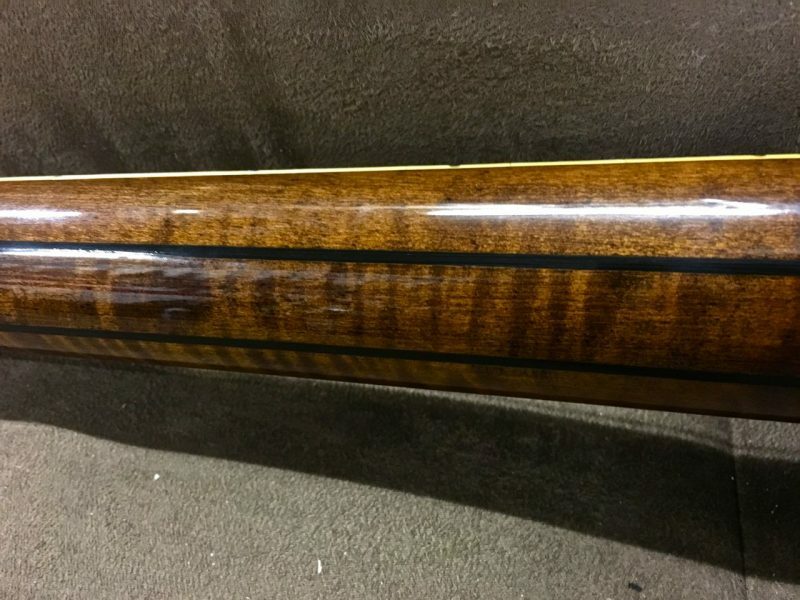 Three-piece flamed maple neck with two walnut strips, a nut width of 1 11/16 inches and a standard Gibson scale length of 24 3/4 inches. 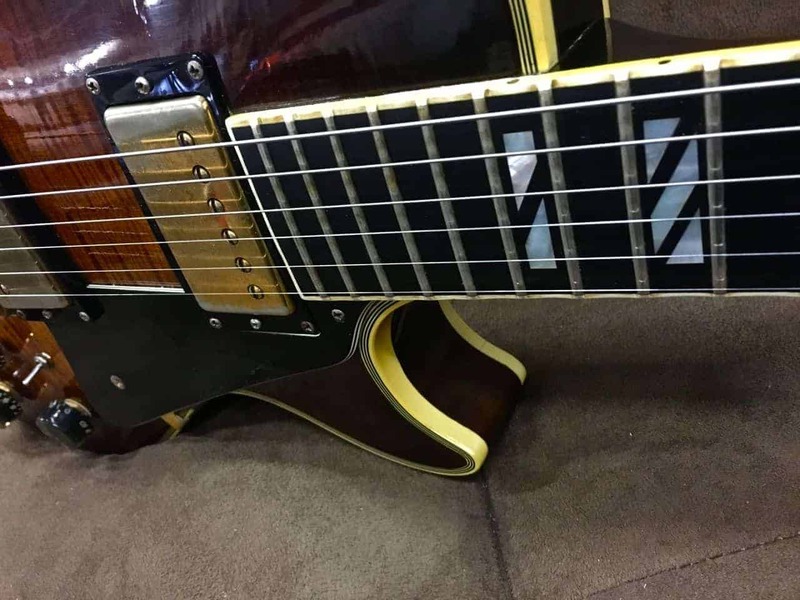 The neck has a very fast medium profile with a volute at the top. 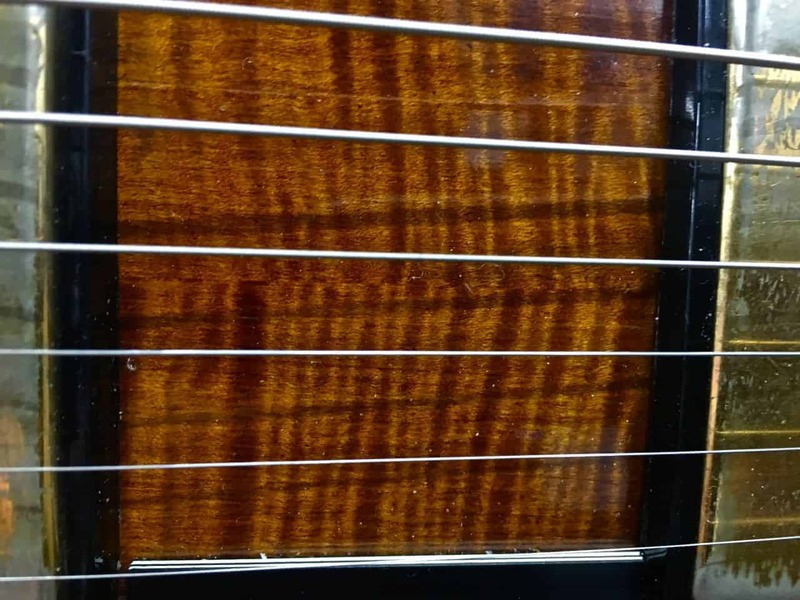 Bound ebony fretboard with original brass nut, 22 original jumbo frets and inlaid pearl split-block position markers (split into three on the first, fifth, ninth, and fifteenth frets and split into two on the seventh, twelfth and seventeenth frets) and abalone side dot inlays. 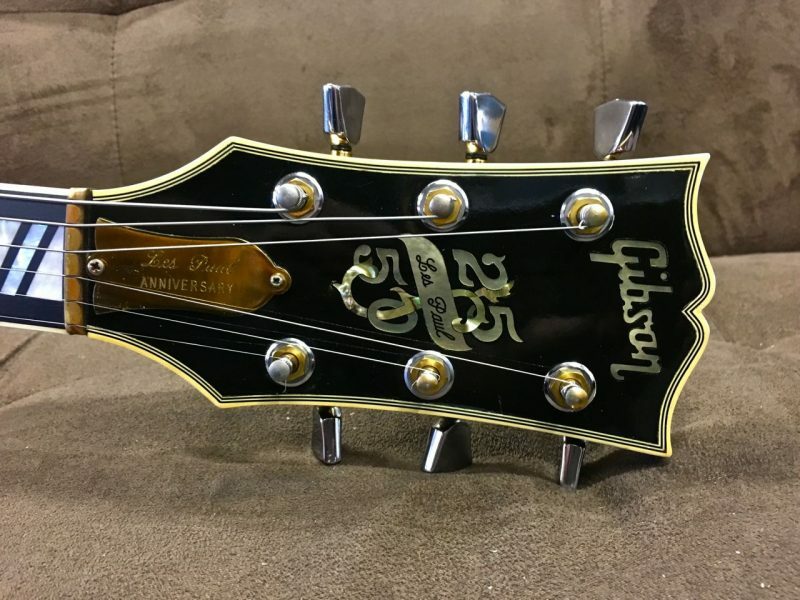 Headstock face with inlaid pearl “Gibson” logo and pearl “Les Paul 25/50” banner. 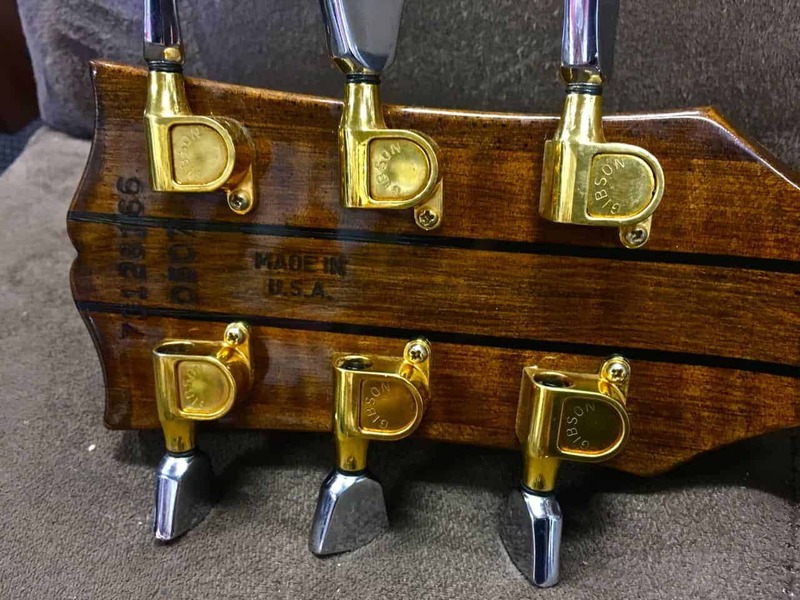 Bell-shaped brass truss-rod cover engraved “Les Paul / Anniversary”. 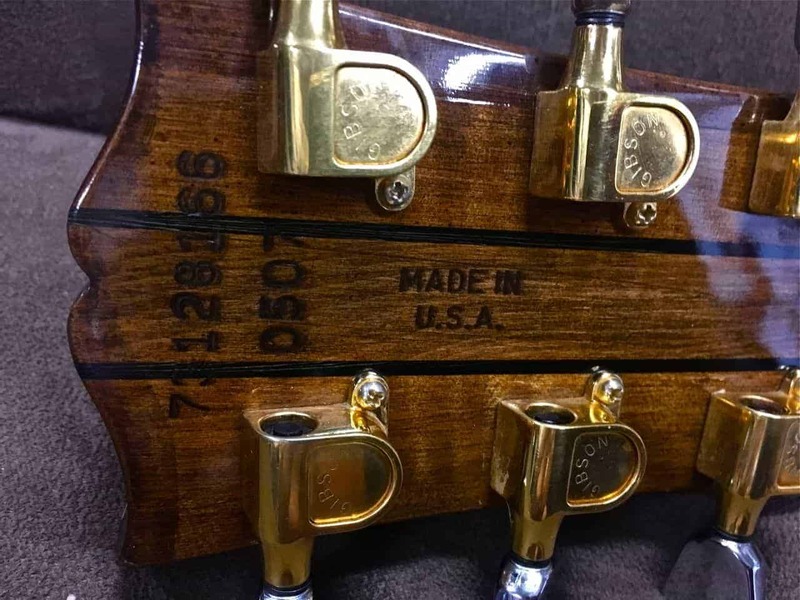 Serial number “73128166 / 0507” impressed into the back of the headstock with “Made in U.S.A.” below it. 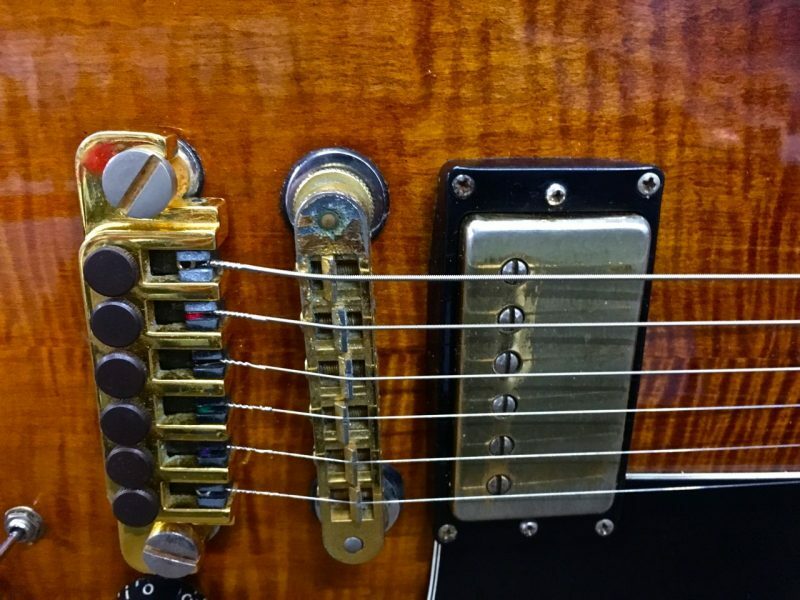 Individual Schaller-style “Gibson” gold-plated tuners with bell-shaped silver-metal buttons. 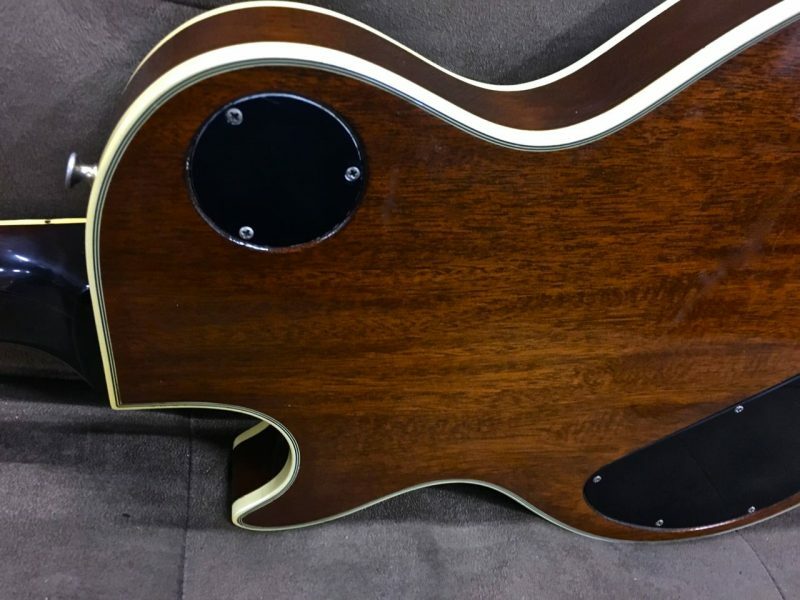 The body of the guitar has seven-ply binding on top and five-ply binding on bottom, the headstock has five-ply binding, and the neck is single-bound. Two Gibson Series Vll humbucker pickups with outputs of 8.0 k with black plastic surrounds. Five-layer black over white plastic pickguard. Four controls (two volume, two tone) and two by two-way coil tapping switch on lower treble bout plus three-way pickup selector switch on upper bass bout. The potentiometers are stamped “137 7828” (CTS July 1978). Black plastic barrel-shaped ‘speed’ knobs. Nashville-style ABR-1 Tune-O-Matic bridge and separate TP-6 fine tuning stud tailpiece. All hardware gold-plated. This guitar is in near mint (9.25) condition, with only a few miniscule belt buckle marks on the back. Housed in the original Gibson black ‘Protector’ hardshell case with maroon plush lining with one catch broken (8.50). 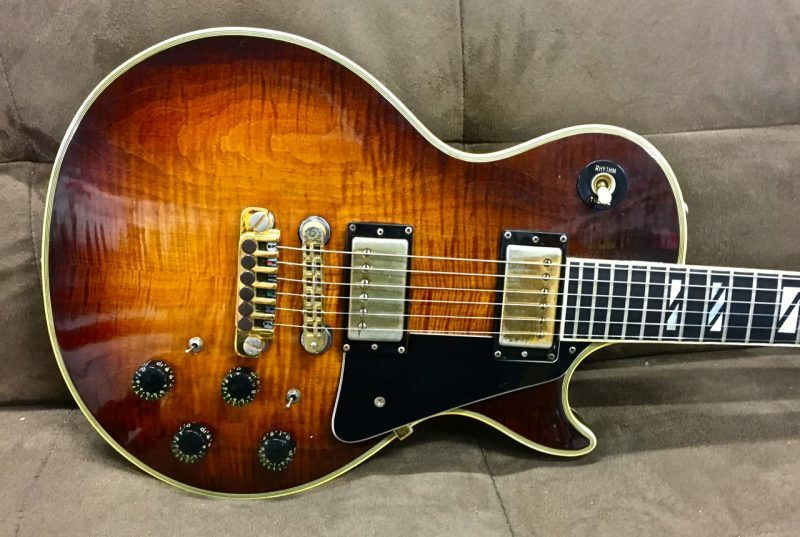 “Gibson 25th Anniversary Les Paul, 1979. 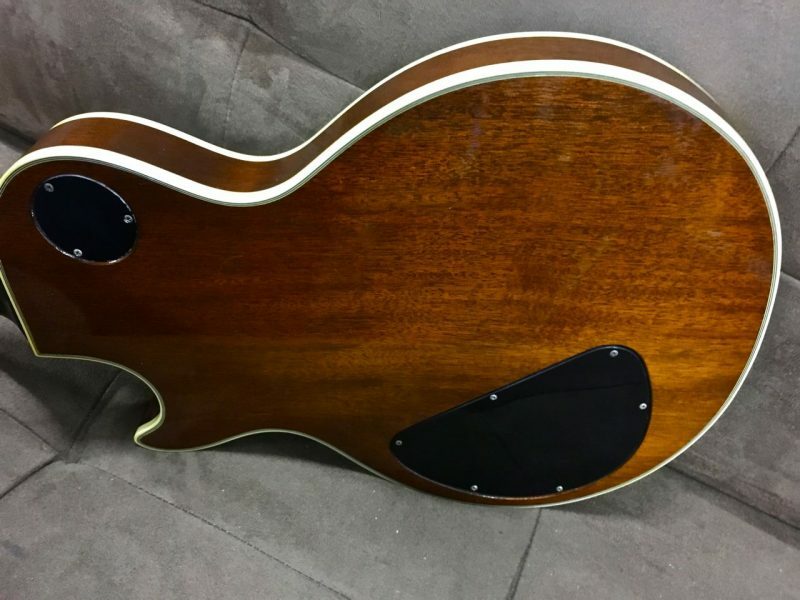 This special-order model featured a flamed maple top and Super 400-style fingerboard inlay. 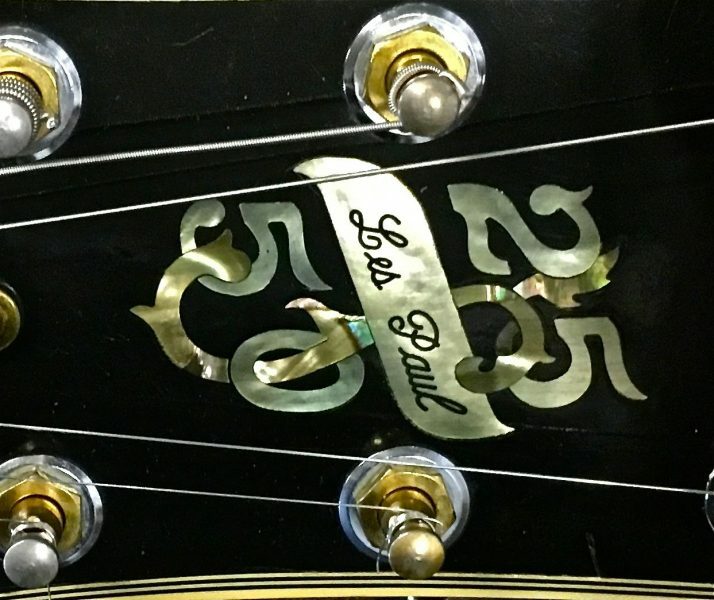 The peghead ornamentation commemorates the Les Paul Custom’s 25th anniversary and Les Paul’s 50th anniversary as a performer” (George Gruhn and Walter Carter, Electric Guitars and Basses: A Photographic History, p. 159). 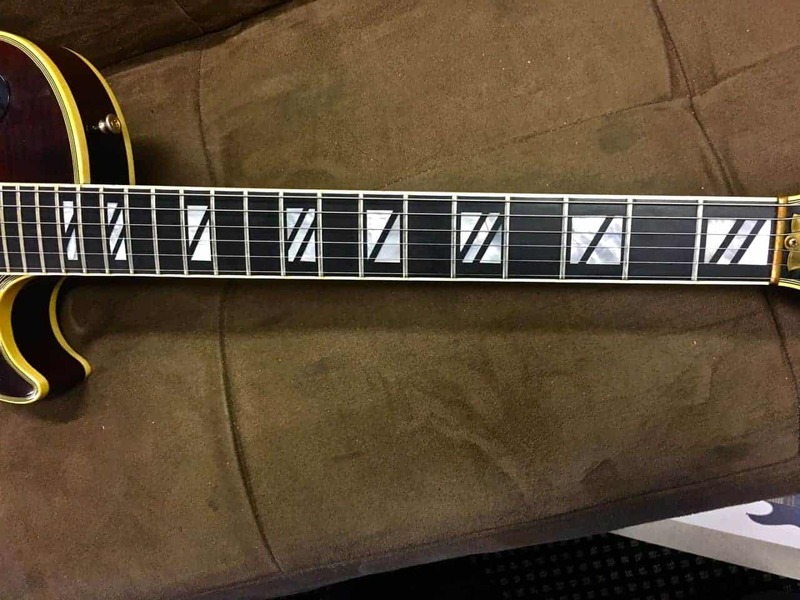 “25th Anniversary Les Paul: limited edition to mark 25th anniversary of model, 50th anniversary of Les Paul’s career, carved maple top, 2 humbucking pickups, coil-tap switch, black barrel knobs, tune-o-matic bridge, TP-6 tailpiece, bound fingerboard and peghead, slashed-block inlay, brass nut, 25 over 50 inlaid on peghead, metal keystone tuner buttons, gold-plated hardware, cherry sunburst, black, wine red or natural finish, regular serial number and limited edition number on back of peghead, at least 1842 produced. Available by special order (some with 1978 number): 1979” (Gruhn’s Guide to Vintage Guitars, p. 220).